In a previous article, I discussed the considerations for building the Homemade Adjustable Safety Squat rack or HASS rack. So can you build safety squat racks that are freestanding to allow different length barbells yet stable enough not to topple over? Yes, you can. The squat racks are all metal and you don't even need welding equipment. Shown below is a pair of the squat racks I built when they were newly painted. They're positioned below for the squat exercise. A barbell is shown atop the barbell supports of the squat racks. 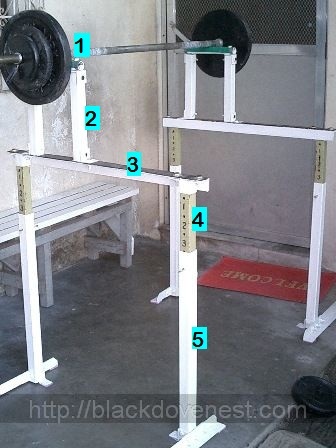 Each squat rack is essentially made of 3 metal components that are easily put together: 2 posts and the rack assembly. The rack assembly has 2 metal tubes that slide into the 2 posts. This allows it to slide down or up so you can adjust the squat rack assembly's height for any of the weightlifting exercises. The barbell catch is typically on top of a barbell support. This is where you drop the barbell bar so the barbell rests securely on a pair of catches. This barbell catch can also double as a handle for the dipping exercise ("dips"). The barbell support is that part of the rack or stand that holds the catch. Also called safeties, safety rack or sometimes "pins" or "rods" when referring to a squat cage. This is the horizontal bar that self-spots a weightlifter. At exercise failure, the weightlifter can choose to simply drop the barbell on the horizontal rack rather than bring the barbell back to the catches. Another function of this squat rack's safety bar is to support the heavy barbell in weight exercises where the barbell starts at a relatively low height like heavy barbell shrugs, barbell rows, Yates rows and back hack squats. The rack tubings of the squat rack, when inserted into the posts, allow you to raise the whole squat rack assembly and adjust the squat rack's height. The rack tubing have level numbers that are spaced at 2 inches. They have holes along the length so you can set the squat rack's height on the post with a locking pin. The posts give stability to the squat racks. Each of the posts has 3 legs (horizontal stabilizers). They also have a pair of holes near the top so you can set the rack's total height with an inserted locking pin. The best benefit of having a safety squat rack at home is the self-spotting feature of the safety bars. A huge majority of weightlifting accidents stem from the inability of the weightlifter to safely rack (or return) a heavy barbell to the bar catch. Some of these accidents occur in the Squats. After going to parallel (thighs parallel to the ground) or lower, the lifter may be forced to sit on the ground or fall on his knees. At this point, it is almost impossible to recover and injury is imminent. The presence of the safety bars self-spots the weightlifter in that he may choose to lower the bar on to the safety bars at the moment of failure. Thus, the safety bar ultimately protects the weightlifter from being pinned or crushed. Storing the squat racks is quick and convenient. Simply remove the locking pins (if you used them) and slide out the rack tubings from the 4 posts. All six disassembled components (2 racks and 4 posts) can easily be accommodated in a footprint that's as small as 3 feet by 1 foot. Shown below are the collapsed squat racks securely tucked behind the weight plate and dumbbell rack which I also built. This is very versatile but how do the safety bars get low enough to do heavy barbell rows etc. This setup supports the lower back and isolates the upper back, lats and rear delts.